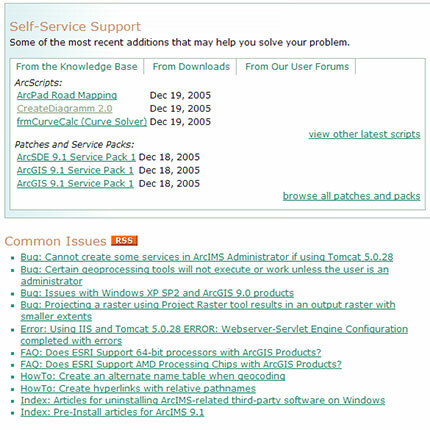 The ESRI Support Center News blog has a screen shot up with the draft look for the new support pages. I’m hopeful the search will be better than it currently is, but I see one change that hasn’t been made yet. The 3 latest knowledge base entries are nice, but how about instead of linking to the knowledge base as a whole, link to a list of the latest knowledge base articles. If 5 new KB articles go up at one time, you’d miss at least 2 of them unless you knew where to look. This should be the default action for all those “Latest Addition” sections. There is no way to keep track of all the latest KB articles or even patches unless someone posts about there in the forums or on a blog.